Grubs are an unpleasant occurrence every year for anybody with grass on their property. Grubs are larvae from beetles that usually lay eggs twice a year in the between spring and late summer. Upon hatching, the grubs begin eating at the roots of grass until they have matured. 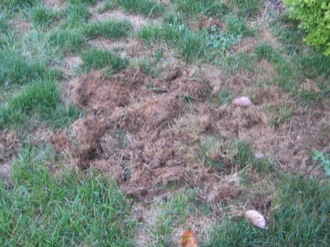 Typical signs of grubs existing in grass are patches of dead grass throughout the lawn. Certain types of wildlife may also be attracted to the areas of grubs, which is a good indicator of the problem. 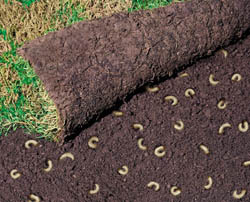 If there is a large amount of grubs in a certain area, the grass may begin to roll up like carpeting and be easily pulled up. Once a lawn is tested for grubs and comes back positive, there are different ways to treat the problem. The most common of these treatments is chemical treatment. Pesticides are used in the damaged areas of grass to help rid the grubs from the soil. It is recommended that these pesticides be used between the dates of August 1 and September 15. You should also apply water over the pesticides to ensure that it reaches the soil. 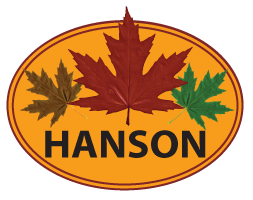 Hanson Landscape does offer a treatment for grubs, for more information give us a call or email. Grubs and their effects that come with them are certainly an unnecessary evil and we are here to help!